Includes: 30 black and white photographs, 2 maps and 25 b/w scans of letters written by Pat aged 5-16 years. To Order via PayPal please click the appropriate Add to Cart buttons for the eBook format you require on each book’s page. Click a button to purchase in your preferred eBook format. You will make payment via PayPal. You can now order print books and eBooks in the same PayPal shopping cart. Pat Booth, author of Pat’s India, returned to India in January 2018 for the 75th anniversary celebration of St Paul’s School, in Agartala, Tripura state. She also visited Darjeeling and Kolkata. Click the link to download a Free 18 page PDF booklet about her fascinating trip. “I found Pat’s India both engaging and informative. Reading it sent me off to the bookshelves to find her mother, Catharine Eade’s autobiography In Heavenly Love Abiding. Read together the two books complement and complete each other. Pat’s India is revelatory in important ways, casting light on the purposes and organisational arrangements of the missionary enterprise, on her parents, the missionaries, as real people with individual personalities and on the costs and rewards of being a family in the mission field. “I could see a range of audiences – great for intermediate age kids doing social studies type projects, great for teachers who have kids from other cultures in their class; great for people researching and writing various kinds of histories, e.g. about the role of “religious colonisation” versus the social support and skills building provided by the missionaries, culture, race and social class etc. There’s no end to it. How do we each define our own intimate culture? How do we know where we belong? Daughter of New Zealand Baptist missionaries, Patricia Booth was born in north-east India during World War Two, just as the Allies’ “forgotten army” fought desperately 250 kilometres away in Kohima to stop the Japanese from invading Assam. She attended school in Darjeeling in the Himalayas until the age of 16. As an 11 year old she lived for a year in Feilding in the Manawatu while her parents were “at home on furlough” as they put it. She felt like a foreigner. In recording her childhood memories, she has pondered on the various cultural influences she experienced. How have they shaped her understanding of who she is and where she belongs as she enters old age? Her most valuable resource has been the 200 letters she wrote from boarding school to her parents over more than ten years which illustrate her development. Many of the letters are reproduced in this book. They have reminded her of the richness and complexity of her childhood. I must have been about 10 when I was urged to pray for Pat and other missionary kids. I was a ‘Ropeholder,’ a member of a Baptist children’s missionary group which ‘held the ropes by love, prayer and work.’ William Carey, founder of the British Baptist Missionary movement in 1792, had likened going to India as a missionary to exploring down a deep dark mine. Departing for India, he said those who went needed “others to hold the ropes for us.” We church kids in Gore, Southland, were doing that. We were told Pat and other missionary children had to leave their parents in the hot plains of India to travel to the cooler hill regions for boarding school. Pathetic pictures were painted for us of grieving children and worried parents. The latter may have been true, but when I met Pat as an adult years later and told her of my (more or less) faithful prayers illusions were shattered. “Oh!” she said, “that must have been why I enjoyed school so much!” Maybe. Knowing Pat’s background, it nevertheless was a shock when I heard her recently tell how she didn’t feel she ‘fitted’ in New Zealand when on furlough with her parents. My image of the sad little children making their way to boarding school had been coloured by what I am, a born and bred Kiwi kid. I knew how I would have felt, away from my parents in a ‘foreign’ country. But the paradox of Pat’s life is that she felt ‘foreign’ in New Zealand as a child. Her reflections on what is her culture tease out that paradox for us. It’s apparent Pat’s childhood experience is more multilayered, multicultural and multi-everything than I had imagined. Her very textured experience was influenced by more factors than I could realise as a child. India is as different from New Zealand as you can get, and swinging between the two countries is a complicated manoeuvre. That makes this book a fascinating and valuable addition to your bookshelf. It is also apparent that the heterogeneous life has produced something very fine. You will see from this book that Pat is a special person. Whether India or New Zealand can be best credited for that or both need be credited you will need to work out for yourself! Thank you Pat for sharing your India with us. Whatever the reason, I’m glad you made it through boarding school! How do we each define our own intimate culture? How do we know where we belong? Daughter of New Zealand Baptist missionaries, Patricia Booth was born in north-east India during World War Two, and attended school in Darjeeling until she was sixteen years old. In recording her childhood memories, she has pondered on the various cultural influences she experienced. How have they shaped her understanding of who she is and where she belongs as she enters old age? Chapter 13 —Am I a Third Culture Kid? 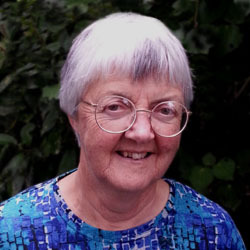 On coming to New Zealand aged 17 years, Pat attended Victoria University, gained a BSc in Zoology and worked briefly in the Wellington Public Hospital Laboratory. In 1965 she married Graham Booth and they brought up four children. Pat has worked mainly in the not-for-profit sector and in 1990 was appointed a Justice of the Peace. 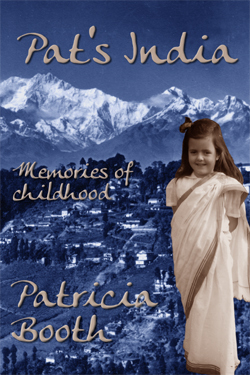 Pat’s India is a companion volume to her mother’s autobiography In Heavenly Love Abiding: memoirs of a missionary wife by Catharine Eade, published posthumously in 2005.